We have a lot of friends ask us what it takes to train their dogs to run with them whilst they ride. 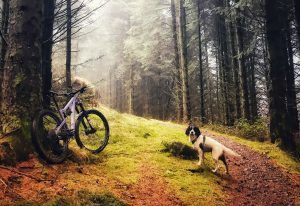 As mountain bikers and dog lovers alike, we love sharing our experiences of what we think are effective ways for you to encourage your dog to run whilst you ride. Here are some tips you might like to consider below but most importantly, the best thing you can do is try it out! Come and join us on one of our social and friendly Bark + Ride outs over on our events page! Taking your dog out on the trail for the first time is so exciting for rider and dog and can make some of the most memorable adventures! However, without the proper training and introduction, it can be a lot to ask of your dog when this is a new experience for him/her. Some dogs are more natural followers, spaniels are the perfect example of this but some dogs need more attention and training otherwise, you and your dog could end up in danger. Think of other trail users as well as yourself and you’ll be everyone’s favourite adventure bud! It’s important to manage your expectations, know your dog’s energy levels and current exercise regime and slowly build on this. Not every dog was born to run for miles every day. Yes in the wild this was a natural experience for them however pet dogs completely differ from one another. One spaniel is different from the next, as is a Jack Russel to a Whippet. If your dog has spent most of its days used to its normal routine his or her twice or three times daily walk this isn’t enough to make a traildog. Understanding the breed of your dog is not only interesting to find out the origins of the breed but important in understanding what he or she was bred for. Harris and Dave out exploring the Cairngorms, an unusual sight seeing Harris behind, as he is usually outrunning us all! Harris our German Wirehaired Pointer was bred for long days on rough ground hunting deer and flushing out game and can cover masses of ground extremely fast. He’s only 14 months old though and despite having a huge amount of boundless energy, he is not yet ready for longer days until he is a fully grown adult at 3. Lewis, eagerly awaiting a lap at Carron Valley Mountain Bike Trails, Falkirk. He sticks to your left side like glue, the perfect traildog. Lewis, the family working Springer, now aged 8 was bred to flush out pheasant in the long heather and can bound up and over obstacles with ease but he is getting a little older now and can’t run as far or as fast as he once did. In human years, he’s in his 50s but still has a great amount of energy. We wouldn’t encourage him out with us too much now but he just loves an adventure! Ambassadog Skye, showing us her amazing strength and focus running behind us. Gorgeous Staffy, Skye one of our awesome Ambassadogs was bred to be a fighting dog, original baiting bulls and bears but wouldn’t hurt a fly, she is a great runner, can do a fair few miles but at a moderate pace. Do your homework on what your dog was built for, your spaniel might be the perfect bark + ride companion, but your friends’ pug or frenchie might not be cut out for this sort of sport. It’s also important not to pigeonhole your breed of dog and understand that just like humans, we’re not all made for running if we have long legs, just like every dog that is tall and skinny isn’t made for running long distances. Introducing your dog to the sights and sounds expected of a trail dog adventure can be a fun way to get closer to your Bark + Ride adventure. 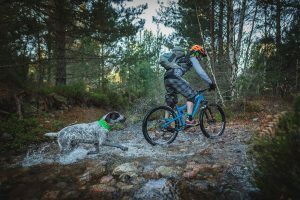 How your bike sounds when it moves, brakes and turns the pedals is all an experience for your dog. All of these sounds are very different to a normal dog walk or run and its important your dogs feels comfortable around your bike so he or she is’nt scared to come to you when you need them to most. Walk your bike into the house and leave it in the kitchen for a day or two so he/she can get used to the sight and smell of it. Encourage your dog to follow you around whilst you walk your bike around the garden. NEVER take a puppy any younger than 12-14months for longer than the recommended walking time. We suggest your first bark and ride experience should start at 6-9months. introducing them to the bike as early as possible in the house but never taking them out until they are at least 9 months. When doing so this must only be for extremely short periods of time and very short distances. No longer than 2k and at a very docile walking pace. You must understand the make up your dogs’ bones which are still forming and are too soft to take any form of impact or endurance at any age under 12 months. Pushing these limits as much as you are excited tot ake he/she out will likely lead to early onset arthritis and bone growth problems as well as painfully sore hips and joints. Your patience will pay off when you have a happy healthy dog which will be able to run with you for many years to come. In the same vein, it is very hard to tell if you have rescued a dog what its past life involved. Maybe it wasn’t exercised enough as a puppy, maybe too much. By slowly building very gradually on the amount and length or speed of any exercise, you will be able to measure how tired your dog has become. Any signs of limping or fatigue ( slumping down, sleeping for long periods of time or exhaustion) should be noted and if necessary further action taken to prevent pneumonia. If you at all suspect your dog is in pain or extreme fatigue or ill health you must take him or her to the vet immediately. It is also worth remembering that without any proper training off leash or on, your dog could be a danger to other trail users. You are in control of what training you provide your dog and you should always feel comfortable with your dog on and off the lead before attempting to ride with them. Make sure plenty of water is always provided, try to keep your dog hydrated a few hours before you plan your ride. Never force your dog to take on too much water pre-ride. Understanding how your dog copes with heat is important. Dogs cannot and do not sweat the way we do, remember to cool him down with a cold trail dog towel or a dip in the river. Always have water on hand but try not to overwater your dog straight after your ride, this can lead to water intoxication and vomiting. A small treat or biscuit is ok after a ride, but not a meal. Give your dog a chance to cool off and relax at home before feeding him. On colder days it’s important to monitor how your dog is dealing with the cold. In extremely low temperatures of snow or frost, you must also consider the effect this will have on the dogs’ paws. In some cases dog booties may be advised however we believe as much as possible that a dogs’ natural paw should be built up gradually to withstand the ground on which he runs or walks. In certain cases, some dogs can be prone to splitting pads or using their paws as breaks. Careful attention should be given to the dogs’ welfare and if at any moment you see he/she may be in pain it is your responsibility to take the dog home or to the local vet to be checked for infection, cuts or sprains. Vetrap is a good bandage to take with you if your dog is prone to this. WHAT IS THE SURFACE OF YOUR TRAIL? Look at the surface of the trail you are riding – we forget that some surfaces can be like walking on glass for our dogs when they’re running fast on the trail because we don’t feel it. Hard sharp shale rocks and hard packed stones often found in trail centres can take their toll on dogs paws. Monitor your dogs behaviour before, during and after your planned ride, just like us humans he or she may not be feeling like speeding down a fast and flowy trail today, if he or she gets excited when you take your bike out the garage, you know its good to go but always check them over first of all. Check his/her paws and joints before and after your ride. Look for ticks, cuts or grass seeds which may have gotten lodged in his/her fur or paws. Check for any signs of lameness or limping. Lethargy or any signs your dog is not himself could be exhaustion and must be monitored if you are at all concerned about your dog take him to the vets immediately. Acknowledge your surroundings, will you be starting in a car park? Next to a busy road? Think about how to keep you both safe in those environments. It’s important to make your dog visible and bright. Look for natural xc singletrack, sandy trails or forestry. Remember even in muddy conditions there are still exposed rocks and routes we don’t feel under our tires. Pine needles, heather, bark, pine cones and stones can be ouchy! Be gentle and patient with them, build up their stamina slowly and surely and give positive reinforcement every single time he or she comes to your side whilst you ride. Just like the most important days of training your dogs to recall, reward, reward, reward! ( we find high value, healthy treats such as cheese or chicken really gets them coming back to you) Let them know you have it and reward them before you leave. With some tasty treats in your pocket, you’re bound to have Fido by your side in a flash! With these tips you will reap the benefits of having a solid, happy and healthy trail dog. So what are you waiting for!, the benefits of being out with your dog on the trail are endless! Not only does riding with your trail dog encourage you to increase your physical activity and stamina, it makes you smile and increases the number of endorphins usually experienced on a bike ride tenfold! What more could you want out of an adventure but to share it with your best buddy! If you have any further questions about how to train your trail dog, please don’t hesitate to get in touch with Bark + Ride Founder, Kaz at karen@barkandridesports.com where she would be happy to advise further and meet up for a bike ride! 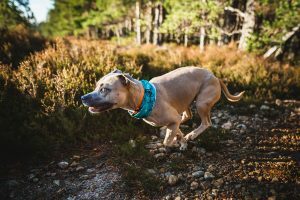 Based in the beautiful Cairngorm National Park, we are very lucky to have some great dog friendly trails on our doorstep. So – what are you waiting for! Come join us, we can’t wait to meet you and your traildogs!